2000 Haas VF-2 4-Axis CNC Vertical Machining Center s/n 20694 w/ Haas Controls, 20-Station ATC, BT-40 Taper Spindle, 10,000 RPM, 20Hp Vector Drive, Rigid Tapping, Programmable Coolant Spigot, M19 Spindle Orientation P and R Codes, Quick Code, Chip Auger, 14” x 36” Table, Coolant, Haas HRT-210 4th Axis Rotary Head w/ Pneumatic 5C Collet Closer. 1995 Fadal VMC3016HT mdl. 904-1 5-Axis CNC Vertical Machining Center s/n 9511280 w/ Full 5-Axis Machining Capability, Fadal CNC 88HS Controls, 21-Station ATC, BT-40 Taper Spindle, 28” Extended “Z” Axis, Thru Spindle Coolant, 422k Memory Expansion, Rigid Tapping, High Speed CPU, Graphics, Coolant, Fadal TR65 4th/5th Axis Trunion Rotary Head with Pneumatic 5C Collet Closer. 1995 Fadal VMC4020 mdl. 906-1 CNC Vertical Machining Center s/n 9503347 w/ Fadal Controls, 30-Station ATC, BT-40 Taper Spindle, 15,000 RPM, 4th Axis Prewire (NO BOARD), 422k Memory Expansion, Rigid Tapping, High Speed CPU, Graphics, Hydro-Sweep System, Fadal mdl. 912-1 Rotary Chip Removal System, Coolant. 1998 Fanuc Robodrill Alpha-T14iA 2-Pallet CNC Drilling Center s/n P98YTH262 w/ Fanuc Series 16-M Controls, 14-Station ATC, BT-30 Taper Spindle, 8000 RPM, 7.5Hp Motor, 14 ½” x 19” Pallet, Travels X= 19.6”, Y= 14.9”, Z= 11.8”, Coolant. 12/1996 Fanuc Robodrill Alpha-10C CNC Drilling Center s/n 96ZT6977 w/ Fanuc Series 16-M Controls, 10-Station ATC, BT-30 Taper Spindle, 80-8000 RPM, 7.5Hp Motor, Travels X= 19.68”, Y= 14.96”, Z= 11.81”, 15 ¼” x 25 ½” Table, Coolant. 1996 Fanuc Robodrill Alpha-10C CNC Drilling Center s/n P969TG740 w/ Fanuc Series 16-M Controls, 10-Station ATC, BT-30 Taper Spindle, 80-8000 RPM, 7.5Hp Motor, Travels X= 19.68”, Y= 14.96”, Z= 11.81”, 15 ¼” x 25 ½” Table, Coolant. Kasuga Quantum Q-1000VS CNC Vertical Machining Center s/n 8020190 w/ Fanuc Series 18i-M Controls, 30-Station ATC, CAT-50 Taper Spindle, Hand Wheel, Daikin Oil Cooler, Chip Conveyor, 23 ½” x 55” Table, High Flow Coolant, 2000 Haas VF-3 4-Axis CNC Vertical Machining Center s/n 22308 w/ Haas Controls, 20-Station ATC, BT-40 Taper Spindle, 10,000 RPM, 20Hp Vector Drive, High Speed Option, Brush “A” Axis, Rigid Tapping, Programmable Coolant Spigot, Coordinate Rotation and Scaling, I/O-N S or Later, WYE-Delta Spindle Motor (Dual Winding), Sigma Motors X-Y-Z, M19 Spindle Orientation P and R Codes, Coil-Type Regen Resistor, Floppy Disc, Chip Auger, 18”” x 48” Table, Coolant. Amada mdl. HA-250 10” Automatic Hydraulic Horizontal Band Saw s/n 456538 w/ Amada Controls, Hydraulic Clamping and Feeds, Coolant. 2001 Elumatec Type SA-142/36 Automatic Up-Acting Cutoff Saw s/n 1423630122 w/ Elumatec Controls, Pneumatic Clamping and Feeds, Conveyor, Dust Collector. Ferrex IntegriCut Side-Acting Cutoff Saw w/ Motorized Stock Feed, Pneumatic Clamping, Dustkop Cyclone Style Dust Collector with Drum Discharge. Grob mdl. NS-24 24” Vertical Band Saw s/n 2713 w/ Blade Welder, 24” x 28” Miter Table. 2011 Haas VF-5SS 5-Axis CNC Vertical Machining Center s/n 1087797 w/ Haas Controls, 40-Station Side-Mounted ATC, BT-40 Taper Spindle, 12,000 RPM Spindle, Wireless Intuitive Probing System, Renishaw Wear System, 30Hp Inline Direct Drive Spindle Motor, Visual Quick Code, Macros, Rigid Tapping, Coordinate Rotation And Scaling, M19 Spindle Orientation P and R Codes, Tap Pre-Orientation, Hand Wheel, 50” x 26” x 25” Work Cap, 23” x 52” Table, Coolant, 2,547 Cycle Start Hours, 1,889 Cut Hours. 6/2010 Haas VF-4SS CNC Vertical Machining Center s/n 1078536 w/ Haas Controls, 40-Station Side Mounted ATC, BT-40 Taper Spindle, 12,000 RPM Spindle, 30Hp Inline Direct Drive Spindle, Haas Wireless Intuitive Probing System, Renishaw 40-2 Touch Probe Head, Renishaw Wear System, Programmable Coolant Spigot, Rigid Tapping, USB Port, (4) Chip Augers, Chip Conveyor, Travels X= 50”, Y= 20”, Z= 25”, 18” x 52” Table, Coolant, 2,501 “ON” Hours.6/2010 Haas VF-4SS CNC Vertical Machining Center s/n 1078537 w/ Haas Controls, 40-Station Side Mounted ATC, BT-40 Taper Spindle, 12,000 RPM Spindle, 30Hp Inline Direct Drive Spindle, Haas Wireless Intuitive Probing System, Renishaw 40-2 Touch Probe Head, Renishaw Wear System, Programmable Coolant Spigot, Rigid Tapping, USB Port, (4) Chip Augers, Chip Conveyor, Travels X= 50”, Y= 20”, Z= 25”, 18” x 52” Table, Coolant. 8/2009 Haas Super VF-4SS CNC Vertical Machining Center s/n 1074913 w/ Haas Controls, 24-Station Side Mounted ATC, BT-40 Taper Spindle, 12,000 RPM, 30Hp Inline Direct Drive Spindle, High Speed Machining, High Speed Tool Changer, 1400 IPM, Advanced Tool Management, Rigid Tapping, Quick Code, Hand Wheel, 50” x 20” x 25” Work Cap, Chip Auger, USB Port, 18” x 52” Table, Coolant. 6/2009 Haas Super VF-4SS CNC Vertical Machining Center s/n 1074240 w/ Haas Controls, 24-Station Side Mounted ATC, BT-40 Taper Spindle, 12,000 RPM Spindle, Inline Direct Drive Spindle, Thru Spindle Coolant, High Speed Machining, High Speed Tool Changer, 34-Position Coolant Spigot, Rigid Tapping, Quick Code, 1400 IPM, Chip Auger, 50” x 20” x 25” Work Cap, 25” x 54” Table, High Flow Coolant. 6/2006 Haas VF-4SS 4-Axis CNC Vertical Machining Center s/n 1050061 w/ Haas Controls, 40-Station Side Mounted ATC, BT-40 Taper Spindle, 12,000 RPM Spindle, 30Hp Inline Direct Drive Spindle, Brushless “A” Axis, Super Speed VOP-SS, High Speed Tool Changer, 1400 IPM, 16mb Expanded Memory, 34-Position Coolant Spigot, Coordinate Rotation and Scaling, Macros, M19 Spindle Orientation P and R Codes, Second MOCON Board, Rigid Tapping, Hand Wheel, 50” x 20” x 25” Work Cap, 18” x 52” Table, Coolant, Haas 4th Axis Rotary Head w/ 5C Spindle Nose Attachment. 2000 Acer Supra-618 II 6” x 18” Surface Grinder s/n N0110923 w/ 6” x 12” Magnetic Chuck. Cuttermaster mdl. HDT-30 Tool and Cutter Grinder s/n 2287B w/ 5C Air Fixture. Sunnen mdl. MBB-1600 Precision Honing Machine s/n 43875 w/ Mandrels, Stones and Truing Sleeves. Darex SP2500 Ultra Precision Drill Sharpener w/ Acces. Import Pedestal Carbide Tool Grinder w/ Diamond Wheels. Boice Crane mdl. 1229 6” Stroke Sander s/n 24562 w/ 18” x 60” Sliding Table. Baldor Pedestal and Bench Grinders. Burr King mdl. 760 2” Belt Sander. Crest mdl. OC4-1218-HE 4-Station Automatic Ultrasonic Cleaning System s/n 1295-T-1039 w/ Allan Bradley PanelView 550 Controls, Robotic Transfer Arm, 12” x 18” Cap, Heated Ultrasonic Wash and Rinse Stations, Digital Heat Controls, Sliding Dryer Cover, Fume Collection System. Sweco Finishing Mill Media Tumbler w/ 36” Tub. (3) CM Topline “Mr. Deburr” Media Tumblers w/ 18” x 35” Tubs. Dynabrade mdl. 644400 36” x 60” Down-Draft Deburring Table s/n 3377. Cyclo-Blast Dry Honer Co. mdl. 3224-F Dry Blast Cabinet w/ Dust Collector. Foster Mfg. “Bench Buddy” 10-Ton Hydraulic H-Frame Press. Sonitek Thermal Heat Staking Press. Quincy QSF60-125 60Hp Rotary Air Compressor w/ 125 PSIG. Ingersoll Rand mdl. 25H-SE 25Hp Rotary Air Compressor s/n K0150 w/ 120 Gallon Tank. Zeks mdl. 300NCGA500 NC Series Refrigerated Air Dryer. 240 Gallon Air Storage Tank. 1997 Command Tooling Systems “Premium” Optical Tooling Setting Gage s/n 0016 w/ Zoller 6051 DRO, 40-Taper and 30-Taper Tooling Adaptors. (4) Kurt 6” Double-Lock Vises. (60) Kurt 6” Angle-Lock Vises. (9) Kurt 4” Angle-Lock Vises. (6) 16”’ x 16” Tooling Tombstones. Tecnara mdl. 240-161-6 BT-40 Taper 90 Degree Milling Head. (6) Huot 40-Taper and 50-Taper Tooling Carts. Lista 13-Drawer Rolling Tooling Cabinet. Lista 13-Drawer and 12-Drawer Tooling Cabinets. (3) Bott/Kennedy 12-Drawer and 11-Drawer Tooling Cabinets. Insert Turning, Threading, Grooving and Boring Tooling, Carbide Inserts. Drills, Taps, Reamers, Radius and Key-Slot Cutters, Carbide and High Speed Endmills. Aluminum Vise Jaws, Chuck Jaws and Fixturing. 2001 Matsuura MAM72-3VS 5-Axis CNC Vertical Machining Cell s/n 010214534 w/ Full 5-Axis Machining Capability, Fanuc Series 16i-M Controls, 240-Station Tooling Magazine, BT-40 Taper Spindle, 15,000 RPM Spindle, 40-Station Pallet Changer, Renishaw Touch Probe System, Renishaw Wear System, Tool Breakage Detection, True 5-Axis Trunion Pallet Cell, Milling Center (FOR PALLETS), Travels X= 550mm (26.77”), Y= 440mm (15.74”), Z= 580mm (24.6”), B= +65 Degrees to -110 Degrees, C= 360 Degrees, Chip Conveyor, High Flow Coolant System. 2000 Matsuura MAM72-3VS 5-Axis CNC Vertical Machining Cell s/n 000214077 w/ Full 5-Axis Machining Capability, Fanuc Series 16i-M Controls, 240-Station Tooling Magazine, BT-40 Taper Spindle, 15,000 RPM Spindle, 40-Station Pallet Changer, Renishaw Touch Probe System, Renishaw Wear System, Automatic Measuring, In-Process Measurement, Tool Breakage Detection, True 5-Axis Trunion Pallet Cell, Milling Center (FOR PALLETS), Travels X= 550mm (26.77”), Y= 440mm (15.74”), Z= 580mm (24.6”), B= +65 Degrees to -110 Degrees, C= 360 Degrees, Chip Conveyor, High Flow Coolant System. 1997 Matsuura MAM-600HF-PC-2 2-Pallet 4-Axis CNC Horizontal Machining Cell s/n 970412452 w/ Matsuura System i80 Controls, 120-Station Tooling Magazine, BT-40 Taper Spindle, 30-8000 Spindle RPM, 1 Degree Indexing Thru Pallets, Tool Setting Probe, Renishaw Wear System, Synchronized Tapping Function, Travels X= 600mm (23.62”), Y= 600mm (23.62”), Z= 625mm (24.6”), Krystil Klear Filtration Coolant Filtration System, Coolant. 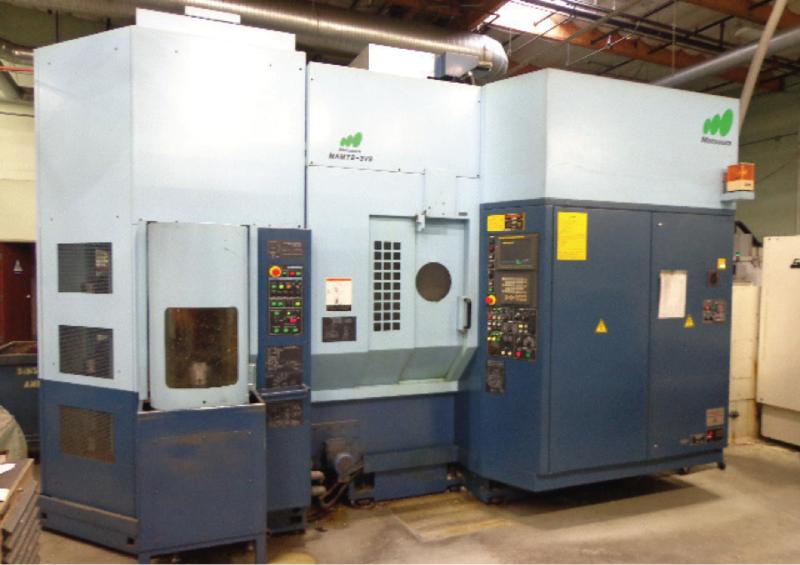 1997 Matsuura MAM-500HF-PC-11 10-Pallet 4-Axis CNC Horizontal Machining Cell s/n 970912779 w/ Matsuura System i80 Controls, 210-Station Tooling Magazine, BT-40 Taper Spindle, 15,000 RPM Spindle, Tool Presetter, Renishaw MP-700 Touch Probe Head, Renishaw M112 Machine Interface, 1 Degree Indexing Thru Pallets, 11 ¾” x 11 ¾” Pallets, Travels X= 500mm (19.68”), Y= 470mm (18.50”), Z= 450mm (17.72”), Daikin Oil Cooler, Chip Auger, Chip Conveyor, High Flow Coolant. Matsuura MC-400H-30-PC11 10-Pallet 4-Axis CNC Horizontal Machining Cell s/n 840244223 w/ Matsuura Yasnac System MX2 Controls, 40-Station ATC, BT-40 Taper Spindle, 10-Pallet Cell, 11 ¾” x 11 ¾” Pallets, (FOR PARTS). 2007 Haas SL-30 CNC Turning Center s/n 3077099 w/ Haas Controls, 12-Station Turret, Tool Presetter, 3400 RPM, 30Hp Vector Dual Drive, Haas VOP-A, Rigid Tapping, Quick Code, Hand Wheel, USB Port, Parts Catcher, Chip Auger, 10” 3-Jaw Power Chuck, S30 Collet Pad Nose, Coolant, Haas Servo-Bar 300 Automatic Bar Loader / Feeder. 2007 Haas SL-10 CNC Turning Center s/n 3077030 w/ Haas Controls, Tool Presetter, 12-Station Turret, 6000 RPM, Haas Vector Drive, Rigid Tapping, Quick Code, 6” 3-Jaw Power Chuck, 5C Collet Nose, Coolant, 13,403 Hours, 5,099 Start Hours. Nakamura-Tome SC-300 CNC Turning Center s/n S304204 w/ Fanuc Series 21-T Controls, 12-Station Turret, Hydraulic Tailstock, Parts Catcher, 10” 3-Jaw Power Chuck, Turbo Chip Conveyor, Coolant. 1995 Nakamura-Tome TMC-20 II CNC Turning center s/n H00902 w/ Fanuc Series 18-T Controls, 12-Station Turret, Parts Catcher, 8” 3-Jaw Power Chuck, 5C Collet Nose, Chip Conveyor, Coolant, LNS Quick Load Automatic Bar Loader / Feeder. Nakamura-Tome Methods Slant 1 CNC Turning Center s/n C23006 w/ Fanuc System 11TE Controls, 12-Station Turret, Hydraulic Tailstock, 4000 RPM, 8” 3-Jaw Power Chuck, 16C Collet Nose, 5C Collet Nose, Chip Conveyor, Coolant. 2008 Brown & Sharpe Global Performance 9-15-8 CMM Machine s/n 0508-6211 w/ Renishaw PH10MQ Motorized Probe Head, Joystick Controller, Renishaw MRC20 CMM Probe Module Change Rack, Working Envelope X= 900mm (35.43”), Y= 1500mm (59.05”), Z= 800mm (31.49”), CMM Fixtures 36” x 60” Aluminum Fixture Plate, 42” x 87” x 9” Granite Surface Plate, Hexagon Metrology PC-DMIS ver 4.3 Software Package, Computer and Acces. 1997 Brown & Sharpe Micro-Xcel PFx 7-10-5D CMM Machine s/n 0697-3431 w/ Renishaw PH10M Motorized Probe Head, Renishaw PHD10 Probe Head Drive Unit, Joystick Controller, Renishaw MRC20 CMM Probe Module Change Rack, Working Envelope X= 700mm (27.56”), Y= 1000mm (39.37”), Z=500mm (19.68”), Rayco Mfg 24” x 32” Aluminum Fixture Plate, 33” x 53” x 4” Granite Surface Plate, Hexagon Metrology PC-DMIS ver 4.3 Software Package, Computer and Acces. Mitutoyo F604 CMM Machine s/n 83032 w/ Quadra-Chek 300 Programmable DRO, Renishaw PH8 Probe Head, Mitutoyo Joystick Controller, Working Envelope X= 24”, Y= 18”, Z= 12”, 21 ½” x 33” x 5” Granite Surface Plate, Steel Probe Set, Computer, Software and Acces. Mitutoyo AE122 CMM Machine s/n 790825 w/ Mitutoyo 3-Axis DRO, 26” x 36” x 6” Granite Surface Plate, Steel Probe Set, Stand. Starrett mdl. HB-400 16” Optical Comparator s/n 51694 w/ Quadra-Chek 200 Programmable DRO, Shadow Probe Detector, Surface and Profile Illumination, 10X and 50X Lenses, 5” x 21” Table, Cabinet Stand. Software, 9 ½” x 13 ½” Glass Table, Computer, Work Bench.